Network television is dying. The past fall was the worst ever for the networks, and outside of a handful of bright spots—The Voice, The Big Bang Theory, the fading Modern Family—the shows that make up the Nielsen top 30 now wouldn’t have been cinches for renewal even five years ago. 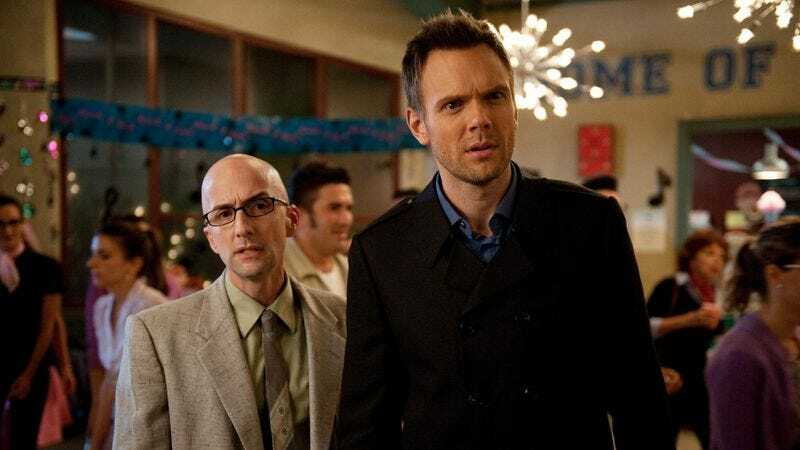 Put another way: Community stands a likely shot at getting a fifth season, even though it frequently pulls a 1.3 in the “key demo” (the 18-to-49-year-olds whose eyeballs advertisers covet), simply because it has a really young audience that’s roughly predictable in size. Even last season, that number likely would have gotten it laughed out of town. Or consider Happy Endings, which returned after several months away with two episodes that averaged a 0.8 in the demo. It, too, seems likely to come back, whether on its normal ABC home or on cable’s USA, both because it has a young, fairly predictable audience, and because it’s close enough to syndication that production studio Sony should be able to bribe ABC or USA with whatever sweet treasures it had locked in its vaults—the treasures that won Community a run this long, a second and ill-considered season of Breaking In, and whatever form that proposed Breaking Bad spinoff takes. Increasingly, network television is about managing its own decline, about deciding whether it wants to put the whole business model in a home, or provide in-house hospice care. Things are falling apart. Everybody knows this. The networks know it, the people who write about TV professionally know it, and even the casual viewers of network TV know it. Would anybody be surprised if five years from now, only CBS, Univision, and a hybrid collective network, streaming site, and Internet portal called ABC-Fox remain? (NBC will be reduced to a newspaper comic strip, while The CW will become an Internet comments section.) The race among ABC, NBC, and Fox in the ratings isn’t for the ratings crown; it’s for the chance to join cash-rich CBS atop the heap after everything goes down and TV becomes a post-apocalyptic wasteland. We’ve moved beyond imagining a future where there are only three networks again (likely CBS, ABC, and Fox); now we’re imagining a future where there are only two networks. The great paradox that keeps network heads awake at nights is that more people are watching TV, but not necessarily watching network TV. And if they are, they’re watching it on DVR or streaming, platforms that are notoriously difficult to make money off of. “So what?” you may say, with a haughty sniff. You are a sophisticated television viewer, and you probably only watch a couple of programs on network television. And I agree! While there are a lot of good-to-great shows on network TV, there are only one or two whose cancellation would make me despair, and the cable model generally produces more daring and exciting television at the moment. When you add in the fact that Netflix, Amazon, and Hulu are all branching into original scripted content with exciting new series and overseas acquisitions, it seems network TV might be a dinosaur struggling to survive post-meteor, while all around, fidgety little mammals are thriving in a very different landscape. If network television is to survive, you might argue, why doesn’t it take lessons from these new species? Why doesn’t it program fewer hours, perhaps having several shows share one timeslot throughout the year, as cable does? Or, failing that, why doesn’t it expand its online streaming options to allow a greater audience to access its product? Why can’t network TV adapt and thrive? Other folks who write about TV—and are far smarter than I—have made these arguments, and there’s some truth in them. Television has rapidly become a world of programming toward niches, from the post-apocalyptic zombie freaks that make The Walking Dead so huge to the rural folk who’ve embraced Duck Dynasty. Making money in television now involves aggressively courting a particular niche within the larger culture. The idea of chasing the mass audience—the very idea behind network television—is dying as surely as the mass audience did 15 years ago. We are a nation of subcultures now, and whatever your fancy, there’s a TV network for it. So why don’t the networks ease up and embrace that reality a bit? To that, I say this: The existence of cable networks like FX and AMC, and of the aforementioned streaming sites, is directly attributable to the success of network television. Networks provide a steady flow of cheap content that allows cable networks and streaming platforms to embrace their expensive scripted programming as loss leaders, to say, “Hey, we do awesome stuff over here in cable, and you TV fans should check it out!” The dirty little secret of cable TV is that networks don’t make their profits on that stuff. The really big hits and the cheap comedies might pull in a minor profit, but the big money is in sitcom reruns and reality shows. FX uses a program like Justified to make an argument to cable providers and advertisers: We are a company you want to be in business with. Then the network makes much of its money from endless sitcom reruns that it acquired at low cost and will sell to advertisers at tremendous profit. There is tons of money in this, too. Reruns of The Big Bang Theory routinely pull bigger numbers in the 10 p.m. hour on TBS than anything the broadcast networks are airing, and USA paid a huge amount for Modern Family reruns because it knew it would almost certainly make back that amount, and much more, in ad dollars. (Having that show on the network will also allow it to open up a comedy bloc at half the cost, since it will only need to program one half-hour after an already successful network hit.) The same goes for Netflix, Hulu, or Amazon, too. Having oceans of content on those services requires a lot of different TV content providers, since they’re not yet ready to provide that much content themselves. (Really, no content provider could.) And that means having healthy cable and, yes, broadcast networks to keep shoveling stuff onto these sites, so you keep paying subscription fees. Hopefully it’s now clear the conundrum network TV—and by extension, cable TV—is in, due to the extent the current TV model is based on somebody providing cheap content to someone else, no matter how it’s accomplished. The solutions proposed for network television—Broadcast fewer hours! Have shows share timeslots!—rarely make much monetary sense, because broadcast TV has to broadcast for large periods of time to try to reach the largest numbers of people. It’s a simple question: If network TV stops broadcasting for two or three hours per night, or simply calls uncle on some low-rated night of the week, like Friday, what gets put in those empty time slots? Who’s going to fill them? If it were a cable network, it would be easy enough to pick up another bloc of sitcom reruns. But broadcast networks can’t really do that, not without dipping into their back catalogs. And shortened runs work on cable, where three dramas share a time slot throughout the year, because those are often the only three shows the network has to pay for. On a broadcast network, this would involve effectively tripling the number of shows running on the network at any given time, a far-too-expensive plan. One solution would be for networks to embrace more and more reality TV, the cheap content that’s kept the networks alive for the past decade or so. The problem, however, is that the true “innovators” (using the word loosely) in the reality format are all working on cable. For better or worse, broadcast network reality shows remain basic spins on talent shows and game shows, and the dominant form of cable reality show—the docusoap—is hugely unlikely to succeed with the broadcast networks, due to the stigma attached to the form. So the broadcast networks watch as their popular reality hits slowly deflate, as Dancing With The Stars and American Idol have this season (though both are still highly rated enough to run for years and years). More reality isn’t going to be the solution, and even if it was, who would want that? My solution is fairly simple: Network TV needs to go back to the way it was in the 1950s. It needs to manage its decline in the same way it was born—with weird experimentation, show formats that are cheap to produce, and more product placement (and in-show ads) than you can shake a stick at. There’s already a fair amount of this—at times this season, New Girl has seemed like an elaborate ad for the Ford Escape—but I suspect the only solution is more of it. And, what’s more, networks don’t need to produce fewer episodes of their big hit shows; they need to produce more. When network TV started out, seasons ran up to 39 episodes, meaning three-quarters of the year would have new episodes of a particular series. These ran from late September to early June. They didn’t pause for holidays. They ran and ran and ran, and they usually stayed in the same time slot for a whole season, simply because the sponsor paid for that time slot. Would Happy Endings have become a bigger hit if it had run for 39 straight weeks at 9 p.m. on Tuesdays as General Mills Presents Happy Endings? Doubtful, but at least it would look different. And I don’t think 39 episodes are even necessary. Producing 26 episodes—only four more than the current standard order—is completely doable. (The aforementioned New Girl is producing 25.) And that gets a series to a half-year of new episodes. Producing 30 episodes might even be doable. The question is how to make that much television as cheaply as possible. This probably means fewer scripted dramas, but that’s okay. The broadcast networks, outside of a few scattered shows here and there, don’t really do a great job at making scripted dramas anymore. (It’s also the one TV genre that really does benefit from fewer episodes produced per season.) CBS can probably stand to inflate a few of its crime procedurals to 26 to 30 episodes per season, while the other networks could take their hits and make them share a time slot, the way NBC tried to do with Parenthood and Smash this year. The math there worked out to 32 weeks with new episodes—or would have if Smash hadn’t collapsed. Focusing in like this might have the happy side effect of making broadcast-network drama better, too. In the modern TV landscape, that leaves three forms: the reality show, the multi-camera sitcom, and the single-camera sitcom, in order of expense. All three can be produced cheaply (though it’s often incredibly apparent when single-camera sitcoms are), but any time a network overloads on one format or another, it tends to cause a bit of backlash. Notice how Fox’s overreliance on singing shows is losing its potency, or think back to how NBC’s endless array of bland multi-cams killed it back in the late ’90s and early ’00s. So the answer isn’t just these three formats, or even a mix of all of these formats. No, the answer is to bring back some of the formats that provided some of TV’s earliest hits, even if some of them aren’t exactly classy. Variety shows are cheap to produce, and with strong personalities at the center, they can be tons of fun. Game shows were another staple of early TV that could see a comeback, if the networks don’t overindulge on them. Anthology dramas—series where each episode tells a single story, usually revolving around a common genre or theme—are more expensive than some other forms, but they also avoid the expense of a regular cast and sometimes even a writing staff, provided they can employ someone as prolific as Rod Serling. Sketch comedy hasn’t been in primetime in ages, but some of the very earliest TV hits fell under this broad umbrella. Who’s to say this cheap format couldn’t succeed again? Look to the very successful Univision, which has dusted off many of these formats to great success with the growing Hispanic market. Most of all, network television has to stop thinking of itself as the center of the universe. Even if it’s still the biggest game in town—though only by very slim margins at this point—its job is to figure out how to program to niches of people who have millions of other options. Yes, each network has a rough brand identity and target audience—ABC likes women and families; NBC ostensibly aims for the “quality” TV audience; Fox likes edgy young people; CBS doesn’t mind if old folks leave the TV on after the news—but even those brands are broad, and could be approached as a collection of subcultures and niches. Making distinctive TV on a limited budget—even with corporate sponsorship—is murderously difficult, but the pioneers of TV in the ’40s and ’50s did it on a weekly basis and ended up making some great TV, even though it was occasionally only by accident. Network TV has to try new things, and it has to find a way to seem distinctive and fresh based on a business model that’s anything but. But perhaps the best way to be new and different these days it to try dipping into the past.